Tickets and Registration Systems Part 3: Which is Best? Part 1 of this series looked at the difference between tickets and registration. In Part 2, we covered when to use tickets and registration. This third and final part, guides you through choosing the best system for tickets and registration. Before we look at systems, first let’s consider the experience of attendees using your tickets and registration system. So far, we’ve mostly looked at tickets and registration from the event planner’s perspective. It’s especially important to consider attendee experience when choosing a system. This often tips the scales in one direction or the other, and the capabilities of your current ticket and registration system becomes important here. How much and what type of information must be entered and uploaded? Signing up for other people is usually easy with tickets. Buyers simply enter the number of each ticket type. If the event collects information for each ticket holder, it is important that this step is easy for the buyer. Make sure buying multiple tickets is easy for your buyers. Signing up other people using registration should be easy as well. Attendees want to register for themselves and complete registration for the other members of their group. The registration page must be easily shared. Then, each person in their group can also complete their own registration, if needed. From the registrant or ticket buyer perspective, the less information entered the better! It’s that simple. If you need to collect information from your attendees, make sure your registration form is really easy to use. Make it really easy for people to sign up for your event. Keep your questions to a minimum! Ticket systems are primarily designed to sell groups of tickets in a single transaction. Some ticket systems can collect information about the ticket holders at the time the tickets are purchased. The ticket buyer must enter information for themselves and for each ticket holder. Entering more than a little information about each ticket holder can quickly become a chore for the ticket buyer. Keep questions to a minimum! If you want to collect more than a few items of information from your attendees, registration may be the better approach. 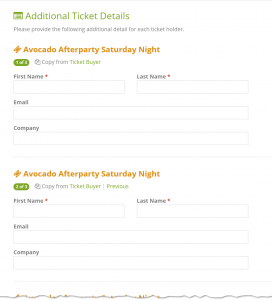 However, if you really want to use tickets, make sure your system is very easy to fill out and provides help and shortcuts to assist your buyers when making their purchase. 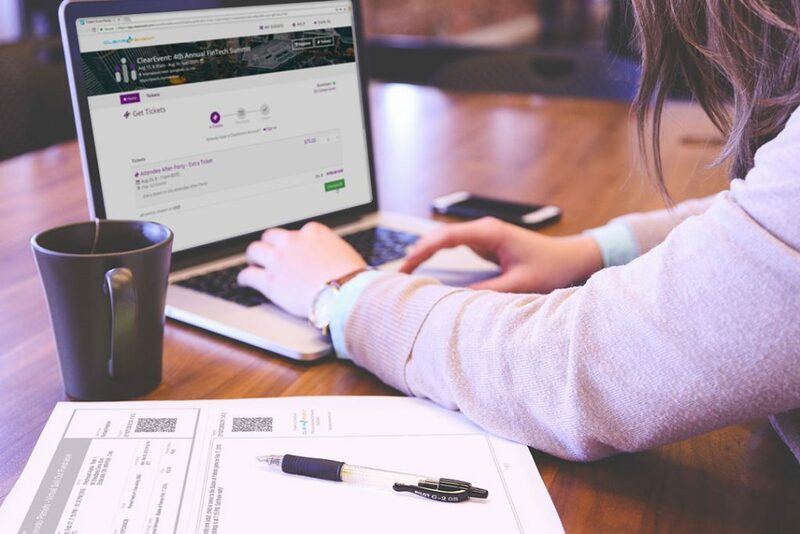 ClearEvent’s simple, well-designed ticket purchase page makes it very easy for ticket buyers to copy previous entries, keeping typing to a minimum. There is a bewildering array of online tickets and registration systems available to event planners. So, what should you look for? As we noted in Part 1, simple events may get away with using tickets or registration. As events get larger and more complex, you’re going to need both tickets and registration for your events. Buyer beware the system that only does tickets, or only does registration! Some systems clearly only do tickets or registration. They were designed specifically for one purpose or the other, not both, and they have not been expanded to include both. Many single use systems claim to do both tickets and registration. Beware! Many only do one well! Ticketing-only systems lack the sophistication and flexibility needed to handle registrations. Everything is treated like a ticket or a ticket sale. 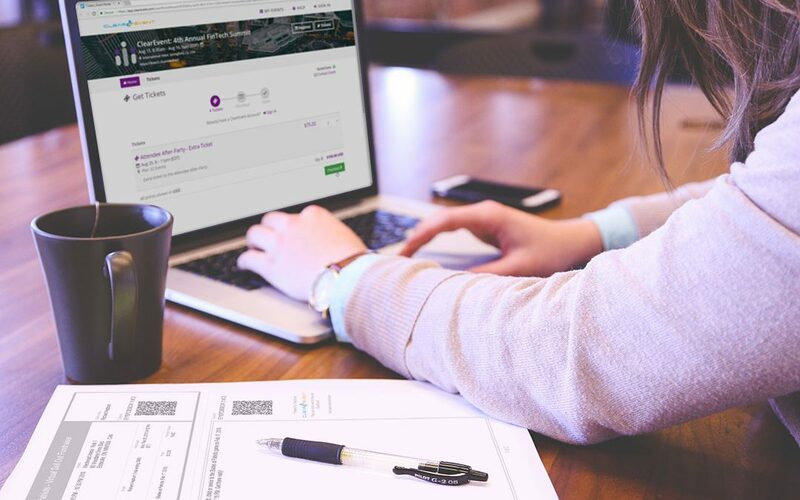 Because tickets are best for situations with low personalization, ticket-only systems lack reporting and communications functions that are so helpful for tracking and managing all the different registrant types. Registration-only systems are generally weak at offering tickets. Using a registration-only system to sell tickets can be difficult for both event planners and attendees because registration-only systems are not designed to produce tickets and manage reporting for tickets and ticket holders. Get Tickets and Registration in One System. Your system should include separate ticket and registration systems in one application, allowing you to do everything you need in a single system. A registration is not a ticket. A ticket is not a registration. Chose a system that has dedicated registration AND tickets capabilities that will each serve your needs well. You should be able to register many different participant types and offer as many different ticket types for your entire event or for parts of your event. What Else Matters in a Tickets and Registration system? Expect more from your online event system! These days event planners should expect an online tickets and registration system that is flexible, affordable and comes with great support. Let’s look more closely at those important factors. Make sure there are robust controls within the registration and tickets parts of the system to give you flexibility you need in your ticket and registration offerings. 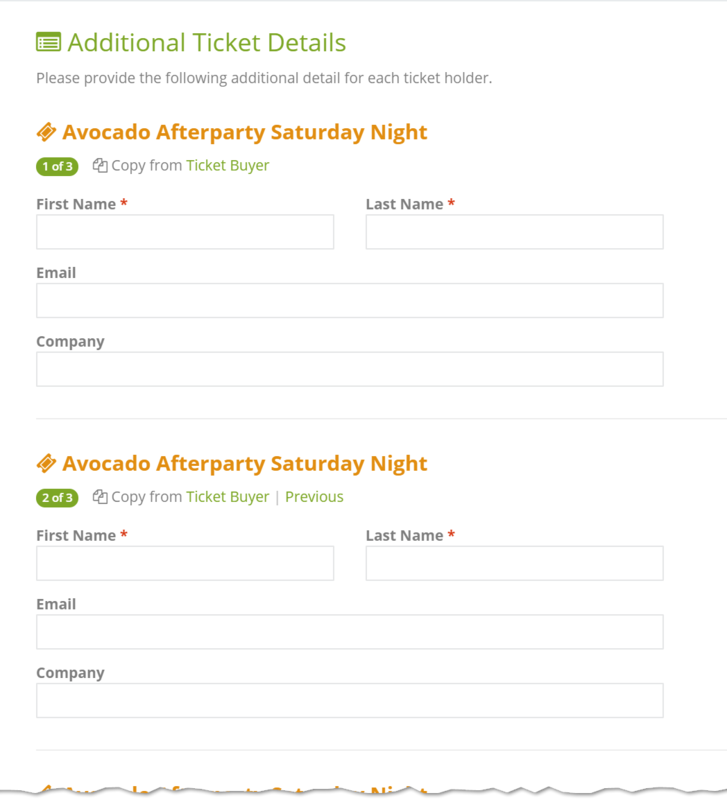 Tickets and Registration forms branded for your event, not the event software company! ClearEvent offers registration and tickets capabilities in an all-in-one online system, beautifully branded and themed for your event. You should reasonably expect to get a ticket and registration system along with a host of other powerful features that save you time, effort and reduce risk for your event. There are many different payment models for event software, and most system will offer multiple plans which include varying features and services. All use some combination of three main payment methods – subscription fees, transactions fees and other service fees. It doesn’t matter whether you pay subscriptions or transaction fees, or other service fees or a combination of all three. What counts is your total price your event must pay in order to use the software for your event. Subscriptions vary widely from $10’s per month to $1000’s per month! Some use flat fees, others depend on how many ‘seats’ you buy for your planners. Annual subscriptions are usually cheaper than monthly subscriptions for the same plan. Make sure you understand what your plan provides and how many of your team will have access and how much that all costs. Transaction fees occur every time the system processes a transaction. Make sure you understand whether fees are paid by your event or are paid by the your buyers and registrants (which you can ignore). Transaction fees paid by the event typically cover credit card processing by a third party processor. Credit card processing fees are usually around 3% and you may also be able to negotiate better rates with your processor. Make sure to set your ticket prices and registration fees to cover all included fees if you elect to include fees in your ticket and registration prices. Other Service fees also vary widely from $100’s to $1,000’s! Some services fees are one-offs, others are recurring charges you must factor in to your cost of use. Service fees cover services performed by the software supplier such as set up, training, design and customization. Make sure you understand which services are necessary in order to make your software 1) operate, 2) do what you need it to do, and, 3) provide the end-user experience you want to deliver. Adding all applicable prices and fees will let you know what your event software system will cost and whether it is value for money or something your budget can afford. No matter what fees and charges, your total cost of event software should not exceed $1000 per year. For many events your software should be significantly less than this amount. Event software and all charges related to it should be a minor cost on your budget. Choose a supplier that has your best interests at heart. Unfortunately, many large suppliers are not able to give you the attention you need and some just treat you like a number. The best suppliers provide expertise in various ways throughout their tickets and registration system as well as providing access to live support when you need it. Take time to choose a supplier who will be a true part of your success formula. Tickets and Registration: You Need Both! It is easy to tell when to use tickets or registration. Just look closely at the level of personalization. Consider these key factors to easily determine when to use Tickets or Registration in each sign up situation. Many events may start out as simple ticketed events. As they grow, tickets and registration both become important to successful planning and delivery of the event. Make sure to use a system that is well-designed to do both Tickets and Registration, not just one of them! Your registration and tickets system should provide a great experience for your attendees. It should be easy to use and provide the flexibility you need. As always, make sure your system is very affordable and well supported. I hope this series of articles is helpful for you. Please contact us if you have any questions or would like to discuss any aspect of Tickets and Registration! As an event planner, knowing what options are available to you is key. Let us know the topics you’d like to hear about that could help your event planning success, at customersuccess@clearevent.com.